One of the most widely known photographs of Earth, this image was taken by the crew of the final Apollo mission as the crew made its way to the Moon. Dubbed the “Blue Marble,” Earth is revealed as both a vast planet home to billions of creatures and a beautiful orb capable of fitting into the pocket of the universe. On December 7, 1972, humans were able to see our entire planet from afar for the first time—a beautiful blue orb hanging in the vast darkness of space, encapsulating all the life we’d ever known. 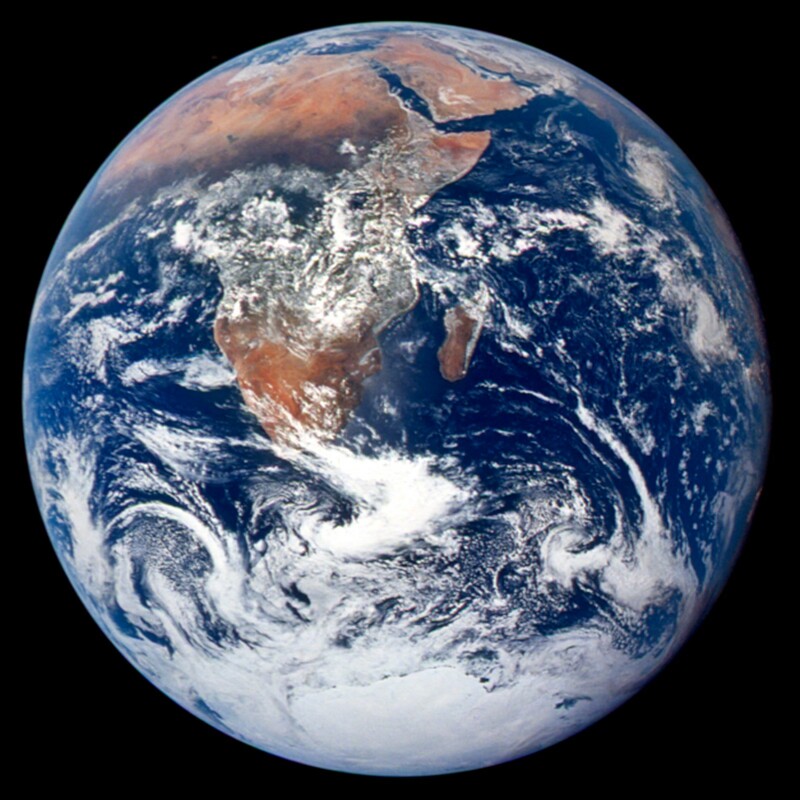 This famous “Blue Marble” photo was taken by the crew of Apollo 17 as they left Earth’s orbit and headed to the moon. Seeing Earth from this viewpoint served as an inspiration for humans to learn more about the planet we call home. “Earth as inspiration” is the theme of this year’s Earth Science Week, an international event started by the American Geosciences Institute in 1998 to instill in the public an improved understanding and appreciation of Earth sciences and encourage stewardship of our planet. As we celebrate Earth Science Week, we reflect on the important role the International Space Station (ISS) plays in studies of the Earth. Positioned in low Earth orbit, the space station provides a powerful platform to view our planet, enabling a wide range of Earth science research. The orbit of the ISS takes it over almost all of the populated regions of our planet and provides views of a given location at different times of the day and year. Studying Earth’s oceans and waterways, landmasses, ecosystems, atmosphere, and weather, there is much we can learn about our planet by looking back on it from space. Read on to discover some of the ways researchers are leveraging the ISS National Lab to study the Earth. Several instruments can be used on the ISS for Earth observation—from high-resolution cameras that provide striking visual images to advanced imaging systems such as hyperspectral and thermal sensors that provide remote sensing data on a wide variety of phenomena. One such instrument is the Hyperspectral Imager for the Coastal Ocean (HICO), which collected more than 10,000 images of Earth while in operation on the ISS from 2009 until 2014. Highlighted below are some ISS National Lab projects that have used HICO data for valuable Earth sciences research. A Hyperspectral Imager for the Coastal Ocean (HICO) image of western Lake Erie, Aug. 15, 2014, taken from the orbital perspective of the International Space Station. HICO data has been used in the detection of harmful algal blooms, which contribute to the occurrence of red tide in coastal areas worldwide. Rapid algae growth can lead to the release of toxins that turn the water red and are harmful to both humans and marine life. Using hyperspectral data from HICO, researchers from remote sensing research and development company BioOptoSense, LLC, were able to develop algorithms for early harmful algal bloom detection, quantification, and classification. Data from HICO has also been used to look at the ability of an ecosystem to convert carbon dioxide into biomass. This measurement, called “ecosystem productivity,” varies across the course of a day, across seasons, and across different types of vegetation and landscapes. It is important for farmers and land managers to understand these variations in order to adjust their use of water and fertilizer and improve crop and forest growth. To estimate ecosystem productivity, scientists can use data from ground-based sensors that measure the movement of carbon dioxide between an ecosystem and the atmosphere. However, sensors are only located at certain sites and only provide information about the immediate area around the sensor. Researchers from the University of Maryland, Baltimore County used HICO data from the ISS together with measurements from ground-based sensors to develop algorithms that enable the use of hyperspectral data to measure ecosystem productivity from low Earth orbit. 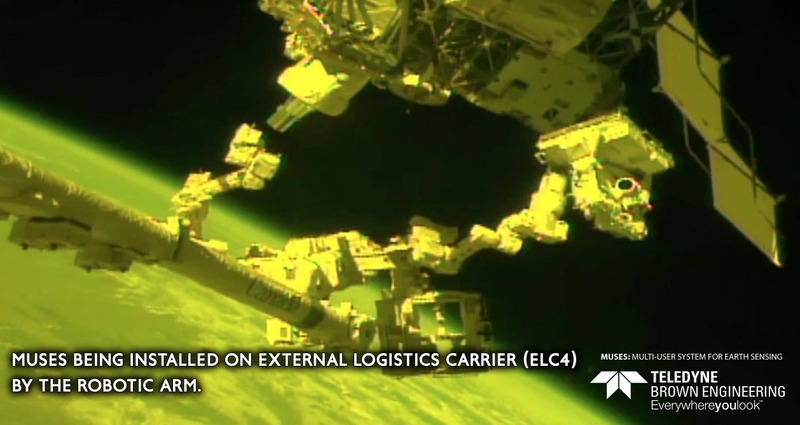 Learn more about this ISS National Lab investigation in this ISS360 article. In another ISS National Lab project, researchers at the Space Science Institute used HICO data to characterize and map minerals formed within playas. A playa is a flat area located in a desert basin that periodically fills with water and is underlain with sand, clay, salt, and silt. The minerals found in some playas contain hazardous metals that could be harmful to humans if dust from the playa were to blow into populated areas during a dust storm. Additionally, salt from playas can affect the salinity of soil in nearby agricultural areas, adversely affecting agricultural production. The ability to characterize playas from low Earth orbit could help improve efforts to mitigate public health issues arising from dust storms and to counter agricultural problems involving soil salinity near playas. 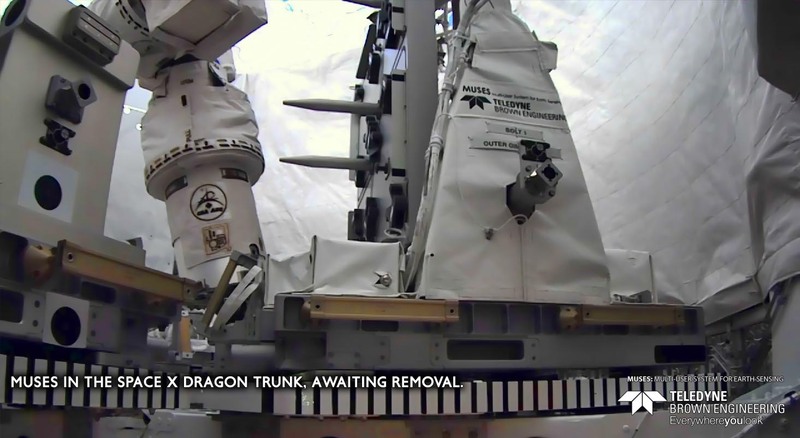 MUSES being installed on the External Logistics Carrier (ELC4) by the robotic arm. The Multi-User System for Earth Sensing (MUSES) platform, built and operated by Teledyne Brown Engineering, launched to the ISS on SpaceX CRS-11 in June 2017. MUSES is a precision-pointing Earth observation platform that can host up to four instruments at once and can be serviced remotely by operators on the ground. 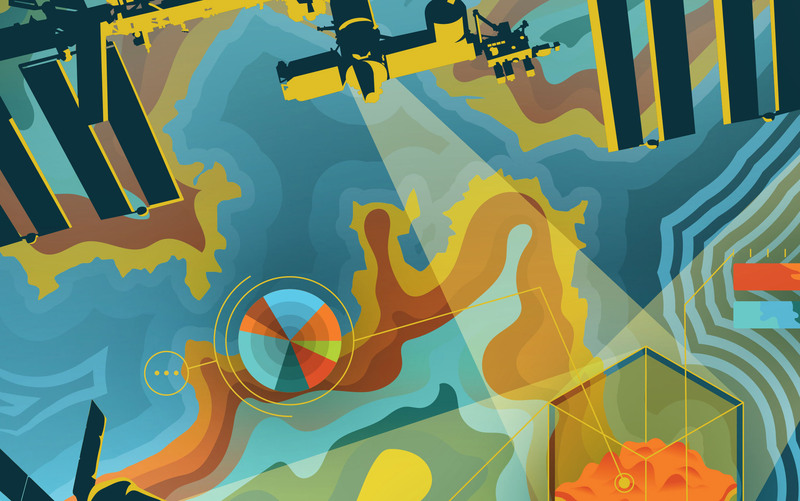 MUSES enables a wide variety of Earth science research—from monitoring water quality and detecting erosion in coastal areas to assessing weather patterns, developing climate models, and tracking natural disasters. MUSES can also be used as a test bed to validate new Earth imaging technology. 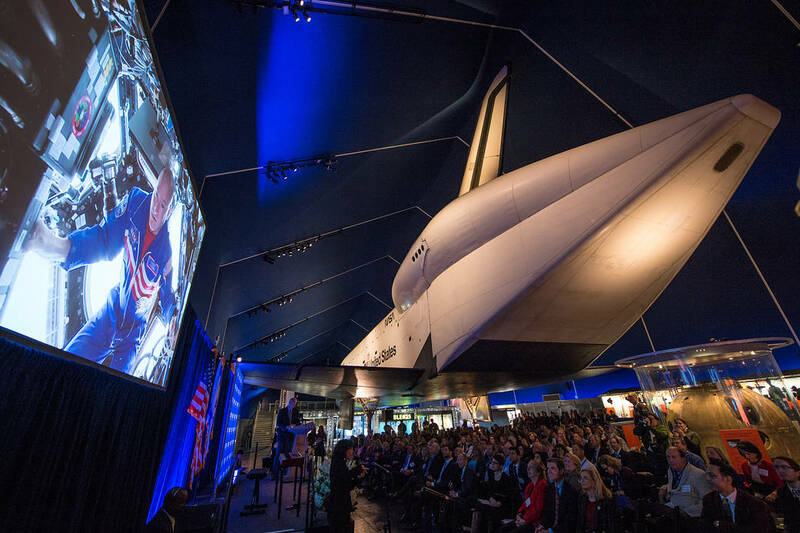 Learn more about MUSES in this ISS360 article. Returning to the Earth Science Week theme of Earth as inspiration, the ISS National Lab provides a unique platform to capture awe-inspiring visual images of our planet from low Earth orbit. 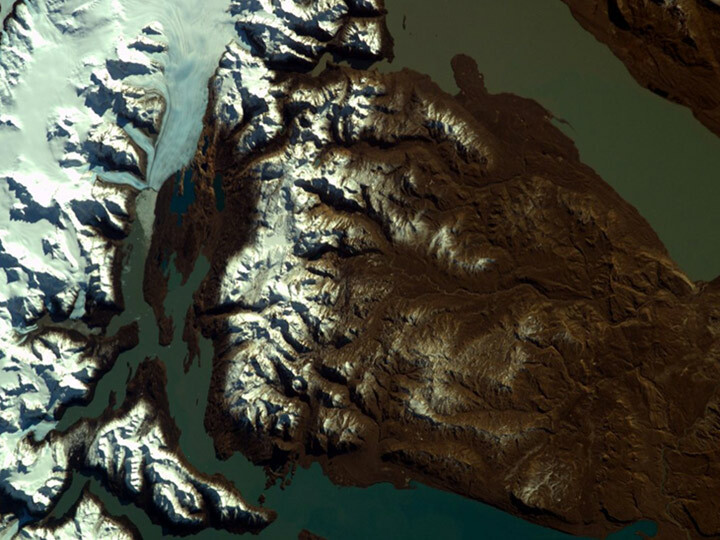 In June, Apple previewed new aerial images of Earth taken by ISS National Lab crew members, and in September, the images were made available to millions of Apple TV users as part of the release of tvOS 12. 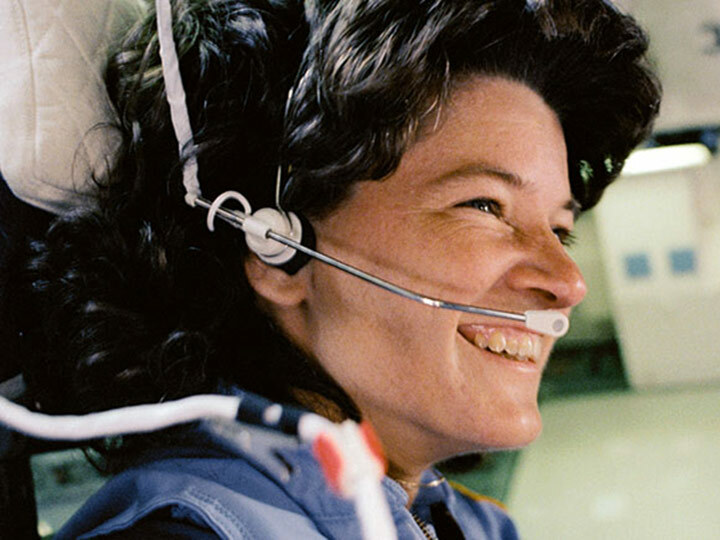 Additionally, through a free educational outreach program called Sally Ride EarthKAM, students can learn about Earth from images taken from the space station. The program allows students to select an area of the Earth for observation, submit a request for a camera onboard the ISS to take photos of the area, and analyze the imagery they receive. Learn more about EarthKAM in this ISS360 guest article. As the ISS now provides us with a continuous view of Earth from space, humans are once again inspired to learn more about our beautiful blue marble.